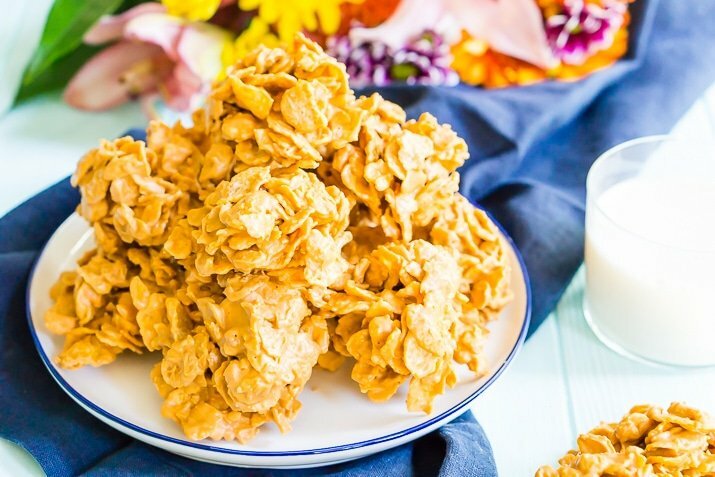 These Butterscotch Cornflake Cookies are made with just three ingredients: peanut butter, butterscotch, and frosted flakes. They’re no-bake too which makes them the perfect easy dessert! 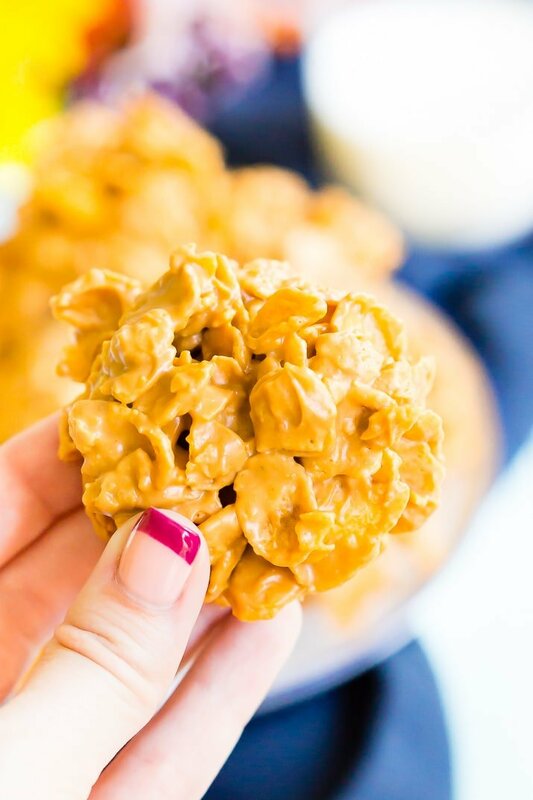 When it comes to easy recipes, I truly think the only one easier than these Butterscotch Cornflake Cookies is chocolate milk, although, these pretzel turtles do come pretty close. Seriously though, we’re talking three ingredients, minimal effort, and no-bake, which makes them an even better in my book. I really love no bake cookies, I don’t care if they’re loaded with sugar, they’re just so damn delicious! For many of us, we probably grew up eating this delicious no-bake treat loaded with sweet and smooth nutty and buttery flavors. Your mom may have even called them Butterscotch Crunchies, is this recipe ringing a bell yet? 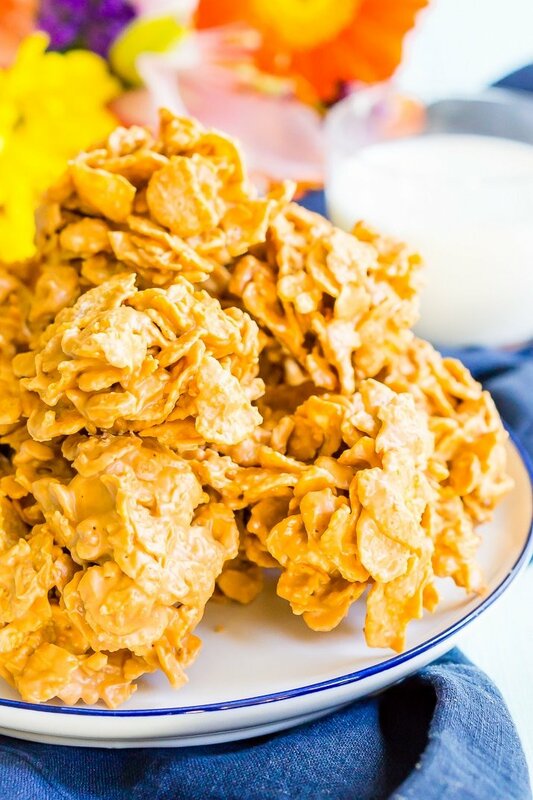 This Butterscotch Cornflake Cookies recipe is such a classic for many reasons, it’s so easy to make with just three ingredients mixed together on the stove top and the cookies themselves are downright addictive. In fact, I want one right now! Because this recipe for Cornflake Cookies has minimal ingredients also make them super affordable to make; if you don’t already have peanut butter in the pantry, it should only cost around $8.00 and you’ll have cereal and peanut butter left over! And you should totally use that peanut butter to make my peanut butter frosting. Bonus Tip: Use crunchy peanut butter for extra “crunch” in your cookies! A friend shared this idea with me last summer and I’ve been making them this way ever since! These are definitely a cookie that you can make fast and the recipe makes a little more than a dozen. It’s a great, quick recipe to whip up last minute for a bake sale or when you just want a fun treat to snack on while watching a movie. But be warned that you will probably want to eat them all by yourself, but it’s probably in your best interest to share! Plus, sharing cookies is a great way to make friends, I swear! Be gentle when mixing the cornflakes into the liquid mixture, you don’t want to break them. 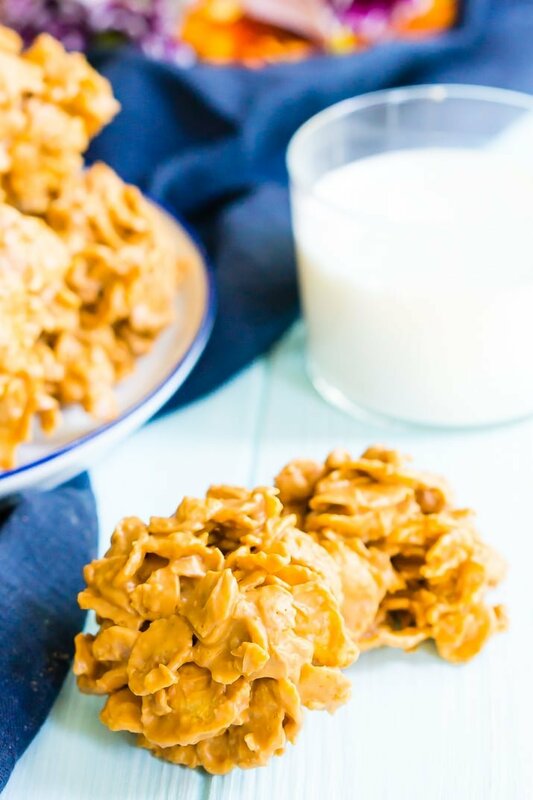 These Butterscotch Cornflake Cookies are made with just three ingredients: peanut butter, butterscotch, and frosted flakes. They're no-bake too which makes them the perfect easy dessert! Stir in cornflakes and remove from heat. Use an ice cream scoop to quickly scoop mounds of the mixture onto wax paper. Allow the cookies to set until firm, usually about 1 hour. It's very important to stir the butterscotch chips frequently when melting so that they don't burn. This Butterscotch Crunchies recipe was originally shared on Centsless Meals. 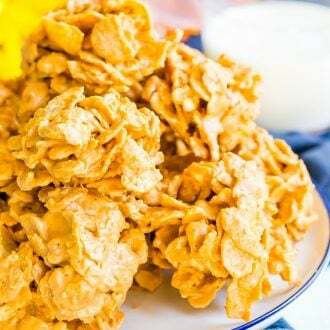 Pin this Cornflake Cookies Recipe for Later! Ooh I love your idea of using crunchy peanut butter in here for a whole extra level of crunchiness. Delicious! YESSSS, these look SO good! Can’t wait to make them, I have everything in my pantry already! They’re so easy, you’re going to love them! Can you make them with just peanut butter and corn flakes if you don’t like or don’t have butterscotch? Do you need to put peanut butter in it? Yes, but you could use sunbutter instead if it’s an allergy concern. I use 4 c chinese noodles or cheerios instead of cornflakes. I’ve been making these for 50 yrs. Last year I added miniture marshmallows and mini m&ms. Chocolate, butterscotch and marshmallows were nummy!